The best advice you can receive if you want to be an NYPD officer is to get your Certificates of Disposition from any arrests or summonses you may have received and your Lifetime Abstract from New York State Department of Motor Vehicles before your complete your Applicant Processing forms. The NYPD or other hiring agency such as, NYC Department of Correction or FDNY have access to all of this information and when you submit an incomplete form they will compare it to their computer printouts and disqualify you. To see other civil service case information visit www.sheerinlaw.com. Recently, the NYPD started interviewing psychologically disqualified NYPD Police Officer candidates after they had received an NOPD and after having a psychologist submitting an expert report on their behalf. If you have an attorney to prepare you for the upcoming NOPD interview your chances to be successful would increase. At times these interviews morph into interrogations and preparation can assist you in being able to handle harsh questioning. No one can criticize you for speaking with someone prior to an oral psychological interview. I would recommend hiring a civil service attorney from the first disqualification to prepare to get the best result in your appeal. Call 516-248-3494 or email kevin@sheerinlaw.com to speak about your appeal and schedule a free consultation with a civil service appeals attorney. Visit www.sheerinlaw.com for more information about NYPD disqualification appeals. Visit civilservice.sheerinlaw.com for more information about Civil Service disqualification appeals. Candidates for NYPD and Nassau County Police Department and other law enforcement agencies may not be aware that the oral psychological exam can be rough. The examiner, most often a Psychologist, can use an aggressive questioning pattern to find out if the candidate can handle confrontation. Also the psychologist may repeat previously asked questions to see if they are are going to be met with consistent answers. The candidate may think to themselves that this is unfair and I’m not be treated properly. The best attitude is to be prepared to be confronted during the interview and maintain your composure. Daubman v Nassau County Civ. Serv. Commn., 195 AD2d 602 (2nd Dept 1993). •	The applicant, a police officer, applied for a position with the police department and passed the requisite examinations. The commission determined that the applicant was disqualified from eligibility based on an X-ray that revealed the presence of a back condition. The commission’s physician speculated that the condition could render the applicant more susceptible to a serious disability if he suffered a future back injury. •	The court held that the commission unlawfully discriminated against the applicant based on his mere membership in a class of persons with the same condition instead of on an individualized assessment of his particular abilities. •	The court held that the determination was arbitrary and capricious because it was premised upon speculation regarding possible future disability rather than fact or concrete medical evidence that the applicant was rendered unfit to perform his duties as a result of his condition. •	On appeal, the court granted the applicant’s petition, annulled the determination of the commission, and reinstated the applicant to the status of an eligible candidate for the position of police officer with the county. •	The court stated that there was no showing petitioner’s condition rendered him incapable of performing in reasonable manner activities involved in being police officer. Furthermore, the court held that the Commission’s determination was premised solely upon speculation regarding possible future disability, and record contains no concrete medical evidence demonstrating petitioner would likely be rendered unfit to perform police duties in future as consequence of his condition. Most importantly, the court decided that the Commission’s determination to be arbitrary and capricious because it is premised upon speculation rather than fact. Read about this Civil Service Disqualification case here. 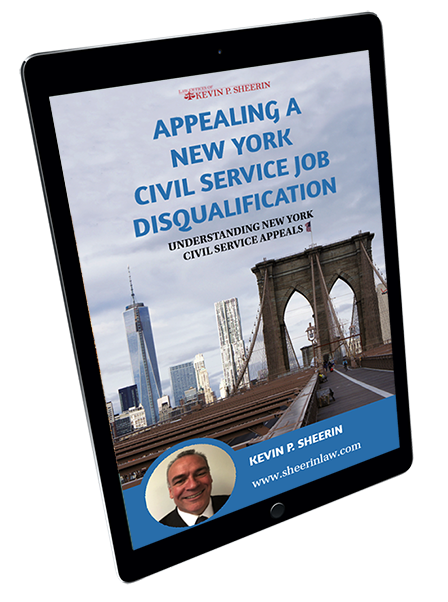 for more information about Civil Service Disqualification Cases. Here is a link to my powerpoint video describing the NYPD disqualification, FDNY disqualification, Department of Correction and other disqualification process.